Happy Easter everyone. Wasn’t the weather fantastic! Our guests made the most of the weather visiting the Sunshine Coast, Ipswich, Brisbane, theme parks and even an evening swim in the netted area in south Moreton Bay at Jacobs Well. We may have been slow hanging the BBQ but it went into overtime very quickly. 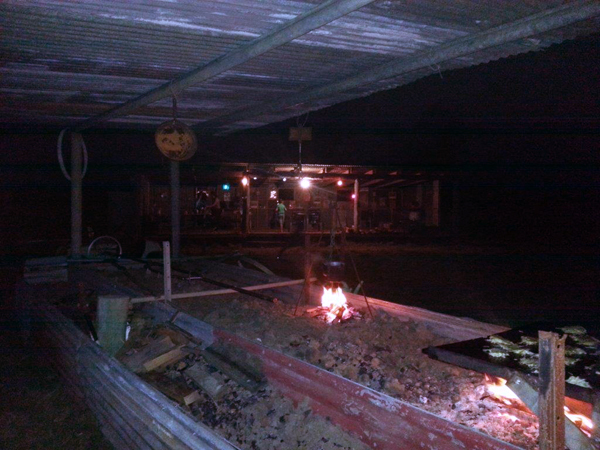 We burn it in the first day then the next day we got the fires burning under the bbq plate and billy. It is quite an art pouring the billy, but once mastered what a great cuppa. Fortunately no-one was home when Murray had his record selection playing. By the time everyone arrived with their selection for the BBQ I had some 70s disco playing. Seems we may need to build a bigger dance hall. We fired up the BBQ again for brekky. I think the eggs came straight from the chickens! There is nothing like cooking toast on an open fire, especially on our ‘LIN’ toaster. After a quick brekky and chat, couple of hours, everyone headed off for their day. North, South and West. Some all the way to Sydney for a day’s work the next day. Thank you everyone for staying and those that didn’t we hope your Easter was enjoyable and as memorable as ours.